Frisco Flag Night: 6:30 pm – 9:30 pm at Frisco High School. The public is invited to see Color Guard shows by all participating Frisco ISD high schools. Admission is free. Frisco Municipal Candidate Election Forum: 6:30 pm – 8:30 pm at Grace Church. Open to the public. All Frisco City Council, Collin College Board of Trustees, and Frisco ISD Board of Trustee candidates will be invited to attend this forum. No registration is required. Connections and Cocktails: 5:30 pm – 7:30 pm. Join the Frisco Young Professionals’ Team Social Committee at the brand-new Berlin Cafe & Bar, 2552 Stonebrook Pkwy #B300. Team Social events are fun, casual and a great way to meet other Frisco Young Professionals. Registration does not include drinks so please plan to pay for your own. Appetizers will be provided. Dual Credit Information Night: 6:00 pm – 7:00 pm at Centennial High School. Frisco ISD and Collin College will host a series of events this spring for students grades 8-11 and their parents to learn more about dual credit opportunities for students. Families may attend the event at their home high school or any other scheduled across the District. Coffee Talk with District Leaders: 8:00 am – 9:00 am at Heritage High School. Frisco ISD parents are invited to share coffee and conversation with the Superintendent of Schools and a member of the School Board. Coffee Talks are held monthly in the library at FISD high schools. NPTA-Frisco Presents The Adventure of Beta Kid: 7:15 pm at the Frisco Discovery Center. After winning an arcade championship, Peter Davis and his little brother Sam take home the grand prize; a rare copy of ‘The Star Chasers’ for their home entertainment system. When they power on the console their beds suddenly transforms into spacecraft and they find themselves launched on a galactic rescue mission in a far off galaxy! Showtimes March 28-31. Inaugural Frisco Fair: March 28 – April 7 at Frisco Fresh Market. Frisco Fair will be an 11-day family fun event with amusement park rides, food, and family entertainment. On March 28, from 6 pm – 8 pm the Frisco Veteran’s Social will take place as well, featuring a special deal for Veterans and their families! Ladies Who Launch – The Art of Relaxation: 6:00 pm – 8:00 pm at Culture A Day Spa in Frisco, 3266 Parkwood Drive, Suite 120, Frisco, TX 75034. Tour the 5-Star Luxury Spa while enjoying refreshments and appetizers, and pamper yourself with one of the complementary “Spa Sampler” services offered exclusively for this event. Space is limited; register in advance. 9th Annual Brainiac Bowl: 6:00 pm – 10:00 pm, benefiting Sci-Tech Discovery Center. The annual Brainiac Bowl, which brings teams together to compete in a light-hearted, spirited trivia competition, along with a silent auction, is a night celebrating science in North Texas. Artist Showcase – Grace Tyler: 6:30 pm – 8:30 pm at the Lincoln Experience Center. This Frisco, TX native has earned great success already at just 17 years old. Also, say hello to artist and musician, and Grammy-winning percussionist, AJ “Rock” Flores. Hear your favorite country hits like never before and discover an all-new set list of beautiful Grace Tyler originals. Enjoy light bites, select drinks, freshly squeezed lemonade, and a delicious gourmet popcorn bar. Inaugural Frisco Fair: March 28 – April 7 at Frisco Fresh Market. Frisco Fair will be an 11-day family fun event with amusement park rides, food, and family entertainment. Greater Frisco Home and Garden Show: March 29-31 at The Ford Center. Featuring thousands of square feet of exhibits, you’ll find builders, remodelers, contractors, building materials, decks, pools, spas, entertainment systems, storage solutions, all kinds of plants, landscape displays, kitchenware, home accessories and more. Spring Blossoms Fashion Show: 7:00 pm – 8:30 pm. Visit Eden Lifestyle Boutique at their neighbor’s place, EQ Kids Club, for a fun fashion show! Bring the kids, or don’t! But grab your gal pals and come out for a fun night! Snacks, swag and fashion! NPTA-Frisco Presents The Adventure of Beta Kid: 11:00 am and 3:00 pm showtimes at the Frisco Discovery Center. After winning an arcade championship, Peter Davis and his little brother Sam take home the grand prize; a rare copy of ‘The Star Chasers’ for their home entertainment system. When they power on the console their beds suddenly transforms into spacecraft and they find themselves launched on a galactic rescue mission in a far off galaxy! Showtimes March 28-31. The Mystery of the Storm: 4:00 pm – 6:00 pm at the Lincoln Experience Center, an event to highlight the breathtaking wonder of extreme weather. Explore an immersive gallery of brooding landscape photography, meet the Texas Storm Chasers in person, and get the inside scoop from Scott Padgett, Chief Meteorologist for CBS 11. Plus, enjoy light bites and select drinks. Guests must be 21 years or older to attend. Beyond Pawlates: 9:00 am at Lava Cantina, benefitting Paws in the City. Your $30 ticket includes a Pilates-driven workout that will get your heart pumping, a delicious healthy brunch (with mimosas, of course! ), and mingling with the adorable Paws in the City dog squad. Bring a mat, water, and dress for a FUN morning outside with Beyond Pilates Studio. Teen Yoga Series: A six-week teen yoga series designed for high-school age girls, freshmen through senior year. Girls will explore yoga in a Christ-centered environment. Class promotes self-confidence and positive body image all while having lots of fun. Contact Dwell Yoga for more information. NPTA-Frisco Presents The Adventure of Beta Kid: 2:15 pm and 5:15 pm showtimes at the Frisco Discovery Center. After winning an arcade championship, Peter Davis and his little brother Sam take home the grand prize; a rare copy of ‘The Star Chasers’ for their home entertainment system. When they power on the console their beds suddenly transforms into spacecraft and they find themselves launched on a galactic rescue mission in a far off galaxy! Showtimes March 28-31. 7922 Rasor Drive, Frisco, TX, 75036: Beautiful curb appeal w gorgeous landscaping. Art niches, elegant arches, custom paint, wood floors and Elfa custom closets. Kitchen features unique brick arch above range. Large island w built in bkfst bar. 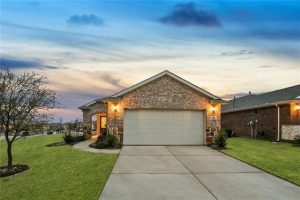 8011 Cool River Dr, Frisco, TX, 75036: Beautiful, one story home on oversized corner lot in Frisco Lakes! Bricked archway and covered front porch. Study w closet can be used as 3rd bdrm. Living rm w wood flooring flows into the dining area and kitchen. 8270 Kentland Dr, Frisco, TX, 75034: Fabulous Darling built home w stone and brick exterior. Hard woods. Open foyer, arched entry. French doors to study. Large Kitchen is bright and light, white subway tile, 5 burner cooktop, and deep farm sink. 3913 San Gabriel Ave., Frisco, TX, 75033: Rare Find PLAZA SERIES home on huge lot in prestigious, gated Newman Village. Charming front patio overlooks neighborhood epicenter. Thoughtful floor plan. Architectural details abound. Gourmet kitchen. Practical Fitness: Mention “Lifestyle Frisco” and receive 15% off any package. BEYOND Pilates Studio: March is National Nutrition Month! BEYOND Pilates has a Nutrition Coach on staff to help you lose weight, increase energy, optimize athletic performance, and improve overall health. Whether you’re 16 or 66, they can help you achieve your goals! Book your free consultation and get 10% off nutrition coaching when you mention Lifestyle Frisco. First Defense Solutions: 25% Off Private and Charter School Audits. Jenny Dean Fitness: Jenny Dean’s first-ever home workout program with HIIT training and POWER yoga is now available. Monat Hair Care: Give your hair what it needs and save money! CUSTOMIZED toxin-free hair products JUST for YOU! No more frizz, thinning hair, split ends, unmanageable hair, or fading color! Take this FREE 3-minute quiz to get started. Jungle Joe’s: Kid’s Eat Free on Tuesdays! Get 1 free kids meal when you purchase another meal of greater or equal value. And get $100 off Birthday Party Packages (good through 3/15)! Frisco School of Music and Performing Arts: $25 off yearly membership with lessons through July. See details; Expires April 30, 2019. Mochas and Javas: Mention this Lifestyle Frisco email at the register and get 10% off your purchase! And, every last Saturday of the month, get HALF OFF all food items! Cherry Blow Dry Bar: Get a $20 complimentary gift card with membership purchase at Cherry Blow Dry Bar! Conquer Fitness and Performance: If you’re a mom in the Frisco area, get ready for Frisco Moms Week, March 25th-29th! Get 5 days of small group personal training for only $20! Limited spots available, sign up now! HeartStories GNO: April 4, 6:30 pm – 9:30 pm at Verona Villa. Bring your circle of women for the “Gather ‘Round” HeartStories GNO where Lindsay Childress with AR Workshop Frisco will be leading a workshop to customize your very own lazy susan as a beautiful reminder to be intentional and ‘Gather ‘Round’. Use discount code LIFESTYLE to register. Om Well – Unlock a Better Mind and Spirit: April 6, 10 am – 3 pm. Frisco Public Library wants to help you live better. Om Well is a dedicated day of wellness featuring local experts who will teach you how to eat better, exercise, and practice mindfulness to gain peace of mind in a chaotic world. Among the featured speakers is Frisco fitness guru Jenny Dean, as well as Frisco Running Club. Inspire Frisco: April 10, 4:30 pm Inspire Park, 6170 Research Rd, Frisco, 75033. Don’t miss the March IF TALK with Laura Beard, Founder and CEO of Sasta. As a 20 year hospitality veteran, Laura has ventured into tech to solve glaring problems within her industry. With her expertise in event production, event management, training and retaining excellent help she is leveraging technology to make the industry better for everyone involved. Texas Big Star Half Marathon and 5K: April 13 at Collin College’s Preston Ridge Campus in Frisco. The first and only endurance race in Frisco, Texas is BACK! Lifestyle Frisco is proud to be a sponsor of the Texas Big Star!